As of March 17, the Assyrian Church of the East in Lebanon had registered 50 families from the region, and more are coming into neighboring Lebanon each day. Michael and Hanna arrived in Lebanon March 11 with their 10-year-old daughter, Elizabeth. They requested that Catholic News Service identify them by pseudonyms to protect their identity, because relatives are among the 300 or so hostages taken by Islamic State in the Feb. 23 rampage on Khabur’s cluster of 35 villages. So far, Islamic State released about 20 of the kidnapped, but there is no news of the remaining hostages, who include women, children and elderly. Michael and his family were awakened around 3 a.m. by the thundering of Islamic State militants bombarding nearby villages. They waited a while to determine if the militants would approach their village, Tal Maghas. By 5 a.m., it was clear they had to escape. “Everyone was terrified and panicking,” Michael said. The family had time only to grab official documents, not even a change of clothes, before fleeing their home. More than 3,000 people eventually fled the Khabur region, arriving first at Tel Tamr, about six miles away, then later traveling to Hassakeh and Qamishli. The uprooted villagers sheltered in churches and houses previously abandoned by other Christians, but the couple still did not feel safe. “We were concerned that Hassakeh would be under siege, too. I was really afraid for my wife and daughter,” Michael said. He reflected on life before the Syrian conflict, now entering its fifth year. Hanna quietly fiddled with a tissue, then quickly wiped tears from her eyes as she listened to her husband. In Lebanon, they are staying with Hanna’s brother and his wife — Milad and Amira — who fled to Lebanon in January, also from the village of Tal Maghas. Milad found work as a custodian for an apartment building in Fanar, a suburb of Beirut. It provides the couple with small living quarters and a monthly stipend that barely covers the cost of food. Located on a hilly incline, the residential area is dominated by concrete buildings and a tangled web of electrical wires amid constant traffic, a sharp contrast to the green agricultural plain back home in Tal Maghas. 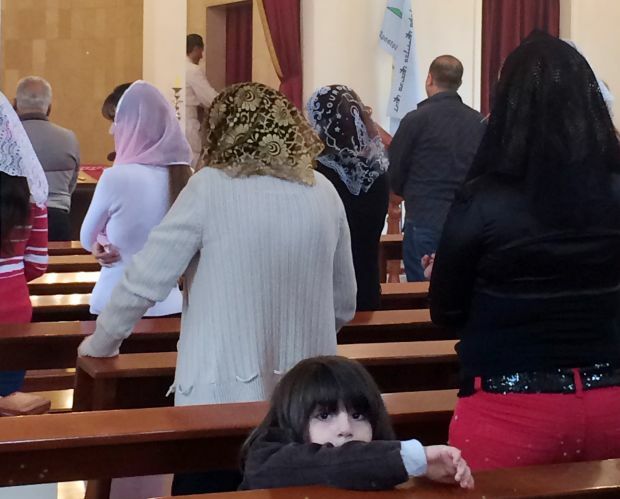 The Assyrian Church of the East in Beirut says that more than 1,300 Assyrian families have fled to Lebanon since the conflict in Syria started, and about 100 Assyrian families arrived from Iraq after the Islamic State’s takeover of Mosul and the Ninevah Plain last summer. Economically strapped Lebanon is now hosting more than 1.5 million refugees — mostly Syrians — putting a strain on the country’s infrastructure and resources for its existing population of around 4 million people. His Lebanese parish established the Assyrian Relief Committee in 2012 to assist Assyrian refugees. For example, funds raised by the committee cover tuition for 120 Assyrian Syrian children and 40 Assyrian Iraqi children at the 200-student St. George Assyrian School adjoining the church in Beirut. Prior to the refugee crisis, the small school’s enrollment included a mix of Lebanese-born Assyrian students, Christians from other denominations and Muslims. “Many initiatives were taken by the international community to avoid the extinction of some types of animals. Isn’t it worth it to protect our people?” he said.